Contusions, abrasions or other surfing related injuries? Major neck problems from going over the falls in sizeable surf (El Porto and Hermosa) and hitting the sand bar. Also some reocurring knee problems. Unfortunately, I don’t get to surf as much as I used to. I had a beautiful 9’ Bing signature gun, shaped by the late Dan Bendickson hanging on my wall. Bing told me that I had to ride the board at least once. One winter morning, Hag’s was giant with 12’ to 15’ faces and a heavy offshore wind. I went home, pulled down my gun, waxed it up and headed back. What made this day special was catching the biggest waves of my life, and being the only one out that day with the prefect board for those conditions. That board is back on my wall with not a scratch, fracture, or pressure ding which was also pretty miraculous. Surfing is all about Stoke and Harmony. We need to get back to Soul surfing and away from the aggro mentality & projection of bad vibes. If you needed open heart surgery, would you have a Podiatrist perform the operation? 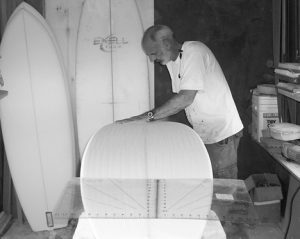 Like Medicine, Surfboard design and manufacturing is an art form, but also an extremely broad field. It’s Foam Surgeons are specialists in their own right although possessing varying degrees of experience. With more choices than ever, it has become increasingly difficult find that truly “Magical” board. Long board? Short Board? Single fin? Twinnie? Thruster? Quad? Custom shaped? Chinese Import? These are just a few considerations that surfboard buyers must now face when deciding it is time for a new stick. The South Bay probably has more legendary surfboard shapers per capita than anywhere in the world. Unfortunately, our waves are mediocre, more often than not. For many, the best solution for summer months is a long board. For those who want a bit more excitement in their life, consider a Zippi Fish. 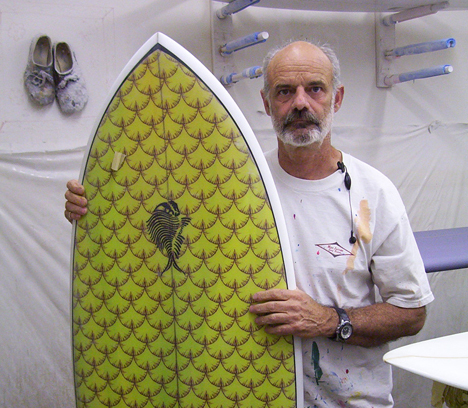 Michael Zippi has been shaping since 1968 and has taken the legendary Fish design into the 21st century. Mike Zippi has broken the fish down to a science. What was once thought of as a board fad is now being turned into a functional high performance board. What used to be a fat bellied bottom, with cumbersome rails, and unnecessarily deep swallow tail, Zippi has honed into a speedy wave magnet. These features allow his fish to fill a niche within the board market for a high performance fish that excels not only in small surf but also in larger hollow waves. Today, prominent locals like Ted Robinson and Jeff Phillips are regulars on a Zippifish. Jeff Phillips has claimed that his Zippifish is solid not only riding in the pocket but in waves as big as ten feet! Most other fish are notorious for being squirrely in larger waves and for being too loose for pocket rides. The wider tail helps the board draw nice long lines and more importantly keeps the tail above water. Why exclusively manufacture a design that was first introduced over 35 years ago? What makes your boards more fun to ride than a traditional thruster. “To put it technically, it’s all about Volume and Water Tension. If you dropped a 2”x 4” in the ocean, its dimensions would allow it to float about 2 inches under water. If you dropped a wide sheet of plywood in the ocean, a good part of it will be floating above water level. Volume is what gives the incredible floatation. In conjunction with water tension, it allows riders to go substantially shorter in length than a traditional thruster shape and get that fun skateboard-like feeling. Fishes have always been fun to ride from day one. Unlike the original Fish though, our modifications have made it possible to ride these boards in well overhead top-to-bottom conditions with amazing control. Thrusters have their place in powerful open ocean island conditions. For typical South Bay conditions, it is all about catching more waves, making ones you never used to, and having as much fun as possible. How did the Clark Foam Fiasco effected your business? Have you gone Epoxy? While I was working with Hap Jacobs, I did contact SurfTech about introducing a Fish to their line up, but they viewed it as a fad at the time and were not very interested. Since then, I have experimented with epoxy boards but have concluded that nothing beats a good polyester foam blank. Recently, I have been getting Blanks from Just Foam and have found their quality to be exceptional. I was expecting to make 500 boards this year BC (Before Clark). Glassed in Fins versus Removable? What do you recommend for your boards? They both have their place. For Glassed in fins, we use Fiber Glass Fin Company Fins. As for those who travel and/or prefer removable fins, LockBox & Rainbow Fins are great. Both are made specifically for my boards and work and hold up great. What is the process to buy a Zippi Fish? “Several options are available. Z.J. Boarding House, Freedom Surf, ET Surf, Huntington Surf and Sport and Icons of Surf are all authorized Zippi Fish Dealers. About 25% of our business is local surfers who have tried a friend’s board and want to get one. South Bay surfers can even make an appointment to borrow a board for a test ride. Go to www.zippifish.com for more details.